The names of which pair of Shakespearean characters appear on the astronomer Tycho Brahe’s coat of arms - in the list of his ancestors? Rosenkrantz and Guildenstern. By a bizarre coincidence, I was just talking about this on usenet with someone who’s looking into medieval and renaissance Scandinavia for a story she’s writing. Shakespeare’s characters are assumed to have been based on Frederick Rosenkrantz and Knud Gyldenstierne, who were present on an embassy to England in 1592, and were respectively Tycho’s third cousin and some other sort of cousin. My other source was (Kitty Ferguson, Tycho and Kepler, Headline Book Publishing, 2002) which talks about Rosenkrantz and Gyldenstierne on pp 261-2. The Swedish branch of the Brahe family has even given name to a city in Finland, Brahestad. 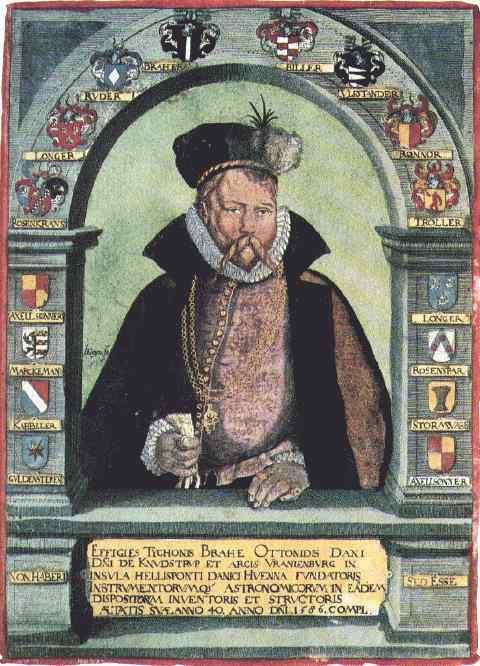 Q: The names of which pair of Shakespearean characters appear on the astronomer Tycho Brahe’s coat of arms - in the list of his ancestors? “Saturn and Venus in conjunction!” - Henry IV, Part Two. Eric Altschuler, Searching for Shakespeare in the stars. Personally I found the idea of Shakespeare as an astronomer rather implausible. There’s something about him that drives people a little bit crazy. Instead, I suspect he was just extraordinarily able to pick up a bit of this and a bit of that. Your answer, Tim, helps explain how he could have done it in this case! The whole lecture is entertaining and informative; Borges argues against the Baconian and Marlowian cases on psychological grounds, even working in a riff on Einsteinian versus Newtonian physics. Borges, Jorge Luis. “The Enigma of Shakespeare” (1964), in Selected Non-Fictions (Penguin: 2000), trans. by Esther Allen. ISBN 0-140-29011-7. I’ve also been pointed at this site, which not only discusses this issue and identifies the relevant ancestors, but also already points both to this discussion and the other one I’ve been involved in! And it also points to you pointing back to it for your picture! And it also points to you pointing back to it for your picture! Thanks for linking to that site! Bored people surfing the web can now bounce endlessly back and forth! And in bouncing back and forth, they can build up momentum and eventually propel their computer beyond the Technological Singularity. I agree that the idea of Shakespeare as an astronomer is rather implausible, but Shakespeare with an interest in Astrology (if only as a comsumer of other’s output) is very possible, given the frequent references in his plays like the quote above. by the way, the nose in this portrait seems retouched.